Projects are primaERP TIME TRACKING's basic unit and according to which the time tracking is done. It is possible to assign them to clients and divide them into taks. Jobs which your clients should be charged for. You will be able to estimate the time it will take to carry out your project and plan a budget. Once you have done so, you can compare the real data with the estimates, which will help you improve your efficiency and calculations. Click on the “MANAGE” option in the main menu and choose “Projects” in the sub-menu. You will then see a list of projects. Click on the downwards pointing arrow which can be found besides the “TRACK TIME” button. The Create Project windows appears; fill in the project’s data. Name*: Designates a name for the Project . Client: Assign a client to the project. If it is a personal project, it is not necessary to fill in this information. 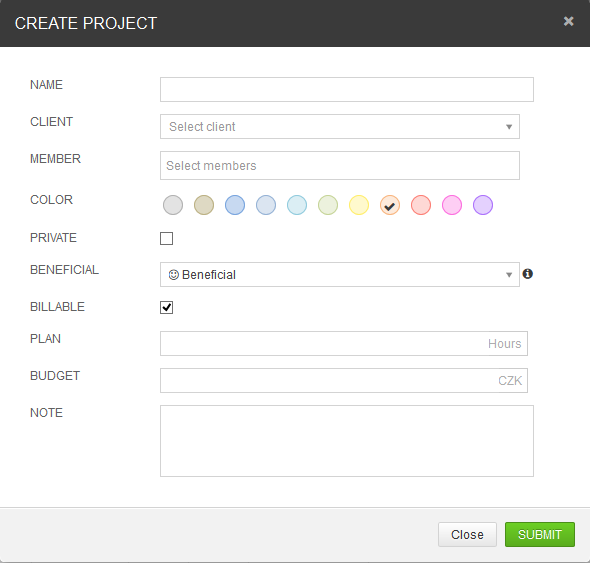 Member: Allows you to select the project members. Color: Assigns the color to represent the project, which will be shown in the Calendar Dashboard. Private: This option makes the project accessible only by the owner of the project and will not be included in the list of the team's projects and in the team reports..
Why is a private project useful? Beneficial:Enables one to measure how beneficial the project is, which will then allow you to see the percentage of beneficial time spent on carrying out the project within a certain time period (day, week, month, year or custom) in the reports. Why is the beneficial attribute useful? . Billable: Enables one to assign a price to the time records, either manually or by using an activity. By default this attribute is marked. Why is the billable attribute useful?. Plan: Allows one to estimate the hours it might take to perform the project. Why is a project plan useful in the app? Budget: Allows one to estimate the revenues of the project. Why is a project budget useful in the app? Note: Brief information about the project. The private projects are those accessible only by the project owner and will be excluded from the list of team projects and reports. These projects are useful for timing personal activities. In order to create a private project, simply tick the “PRIVATE” box when creating or editing a project. Ticking the project as billable gives you the possibility of assigning a price to its time records. Consequently, if this attribute is not selected, the time records created for this project are going to be considered as non-billable. You can see the percentage of time spent on a project and if it has been beneficial for you in the reports. By default it is selected as beneficial. If you mark a project as beneficial, it will allow you to create both beneficial and non-beneficial tasks. If you mark the project, task and activity as beneficial, you can then evaluate the number of beneficial hours that have been invested in the project, according to the time records. If you mark one of them as non-beneficial however, the whole time record will be considered non-beneficial. On the contrary, if you mark the task as non-beneficial, automatically the project and the time records associated with the project will be considered as non-beneficial. Estimating the project hours allows you to have a better overview of the project by comparing the planned with the real time spent on the project. In the project list, you will see the planned time on the right and the real time on the left. By holding the mouse over the planned time, it will display the percentage of actual time reached compared to the planned. 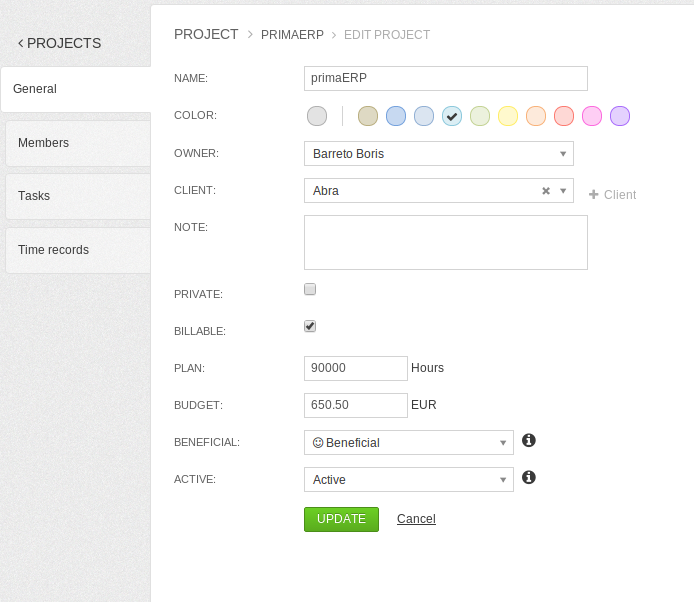 If the time spent on the project exceeds the planned time, primaERP will highlight it in red. This way you can evaluate the process of planning your time in order to improve it. Estimating the project revenues allows you to see how cost-effective the project is by comparing it with the real money earned. In the project list you will see the estimated budget on the right and the real money earned on the left. By holding the mouse over the estimated budget, it will display the percentage of actual revenue reached compared to the estimated one. If the money earned on the project exceeds the budget, primaERP will highlight it in red. This way you can evaluate the process and your calculations in order to improve future estimates. Click on the "MANAGE" option in the main menu and choose "Projects" in the sub-menu. Click on the project you wish to edit. You will enter into the "Project information" section. Make the required changes and click on the "UPDATE" button. *You can also edit projects by using Impulses. Indicates that a project is currently underway and has not yet been completed. While this option is marked, the project will be listed in the Impulses Panel, allowing you to track the time and create time records for the respective project. It is recommended to uncheck this option as soon as the project is complete. Delete: Remove a project from the system including all related information - Time Records and Reports. It is recommended to remove a project only if it has been created by mistake. Deactivate: The project is considered complete. It will simply not be visible in the panel of impulses, so time records can’t be created, but you will not lose the information. In case you need to review a completed project, it will always be available in the list of non-active projects, as well as in the reports..